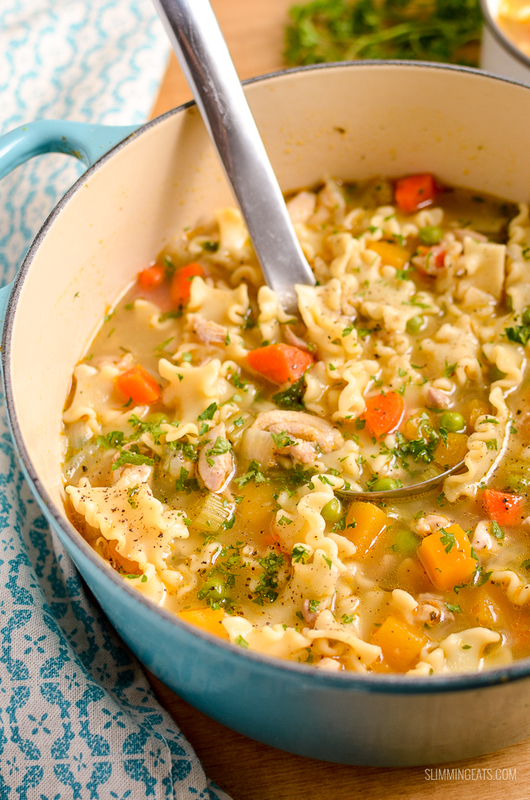 Delicious Syn Free Chicken Vegetable Pasta Soup – a simple easy recipe for the whole family. Now it’s starting to cool down a little, kids have been requesting I make soup more often, its perfect complete meal in a bowl and I can send leftover to school for their lunches the next day in a food flask. The beauty of recipes like this Syn Free Chicken Vegetable Pasta Soup is it’s so easy to make with no syns so that you can enjoy it too. One of the most important things to me when I started on my Slimming World journey, is that I was not wasting time making separate meals for the kids and that’s one of the great things about the Slimming World programme. With the extensive free food list of all those healthy free foods, like lean protein, vegetables, grains etc, you really can’t pick and choose easily and combine together for amazingly taste and family friendly dishes. So when the kids requested soup this week, it was so easy to throw some ingredients together for a healthy and tasty soup. Chicken for protein, vegetables for their healthy fibre and vitamins and then some pasta just to make it a bit more substantial and filling. 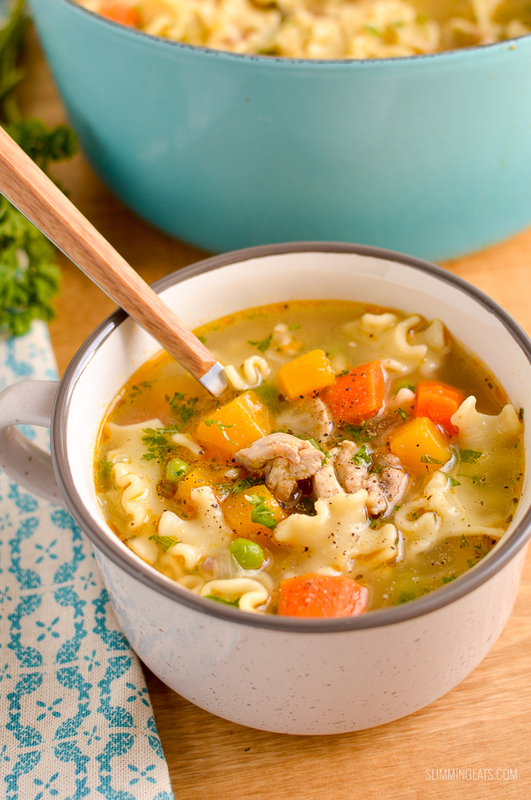 My kids absolutely loved this Syn Free Chicken Vegetable Pasta Soup and it’s definitely one I am going to be adding to my regular rotation over the colder months. 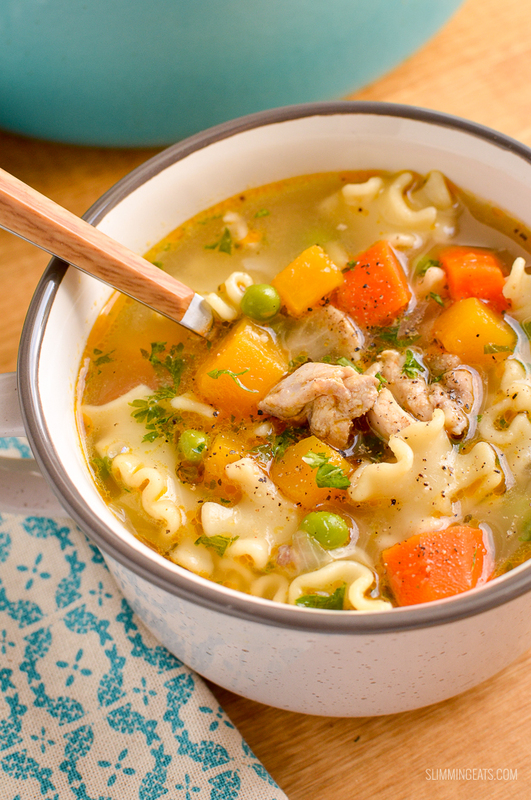 How can I add a 1/3 speed foods to this Chicken Vegetable Pasta Soup? I’ve got you totally covered in this yummy recipe as it comes packed with healthy vegetables such as onion, celery, garlic, carrots and butternut squash. But you really could add any speed vegetable into this, if you love greens, a few handfuls of shredded kale are delicious too. 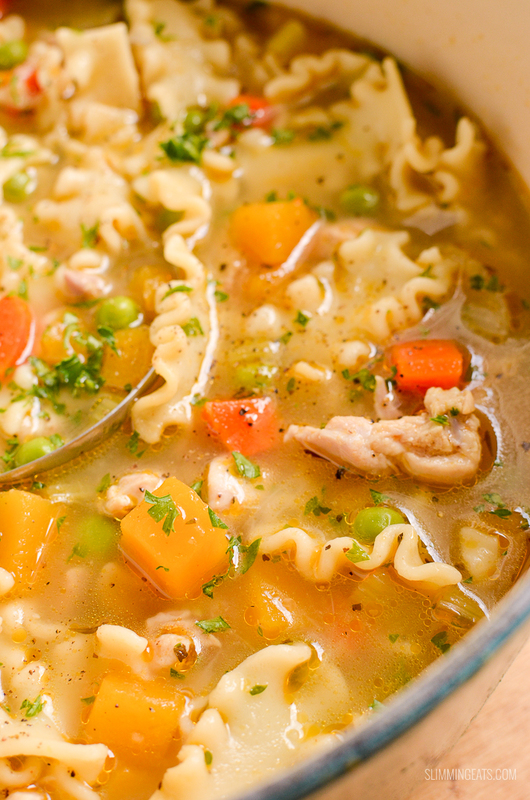 What Kitchen Items do I need to make this Chicken Vegetable Pasta Soup? 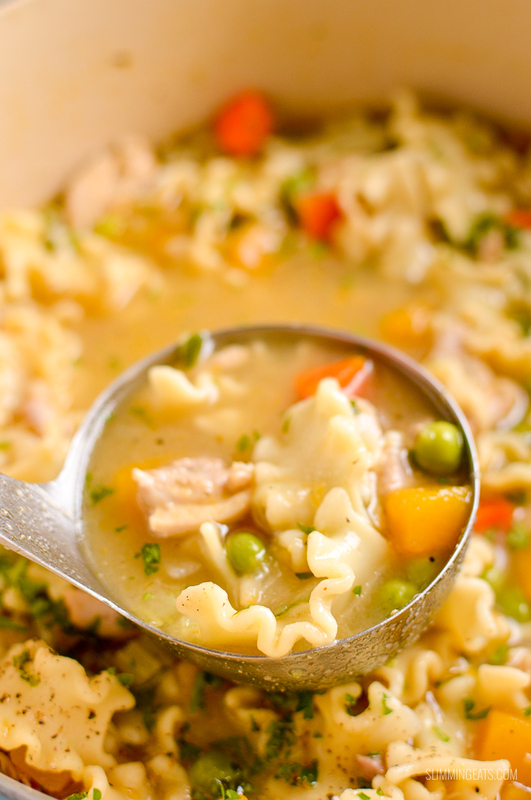 Delicious Syn Free Chicken Vegetable Pasta Soup - a simple easy recipe for the whole family. Add the chicken, paprika, chilli, cumin, onion powder, a little salt and black pepper and cook until browned, remove and set aside. Spray the pot with a little more cooking oil spray, add the onion, celery and carrot and a little of the stock to deglaze the pan and fry for a couple of minutes until the onion is translucent. Add the butternut squash and garlic, return the chicken, add the mixed herbs and stock, bring to boil and simmer for about 8 mins until the vegetables are tender. Stir in the peas and a little fresh parsley, season as needed with salt and black pepper. This looks delicious and I would like to try it next week. Do you need to chop or shred tha chicken? Would I be able to make this in a slow cooker? Just made this, looks and smells gorgeous. How long will this keep in the fridge? And is it okay to freeze? I usually say 3 days in fridge for soups with meat/poultry added.